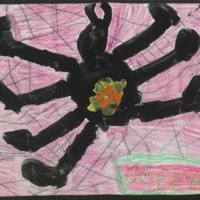 Drawing in crayon, tempera, and graphite of a spider in its web with a pattern on its back. 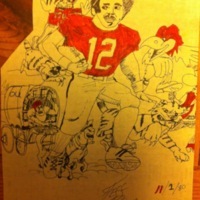 Artist's signature included in a demarcated space on bottom right. 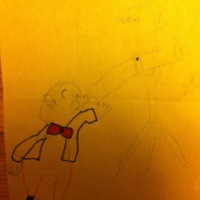 Drawing in pen and graphite of the cartoon character Porky Pig looking through a telescope. 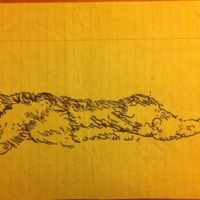 Drawing in pen of rabbit in prone position or in the act of leaping, created at age 9. 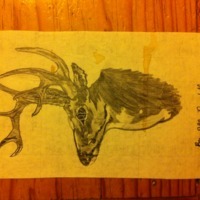 Drawing in graphite of a deer head, possibly a trophy head, created on 4/4/1980 at age 12. 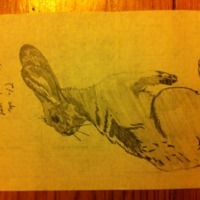 Drawing in graphite of an alert rabbit looking over its shoulder, resembling those often seen in and around Lincoln, NE. 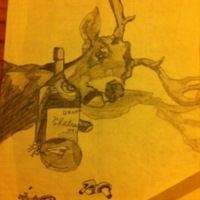 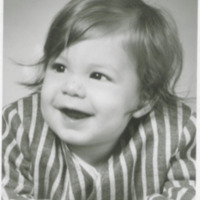 Created at age 12 on 1/4/1980. 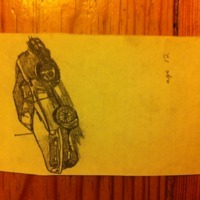 Drawing in graphite of a stock car, muscle car, or remote control car. 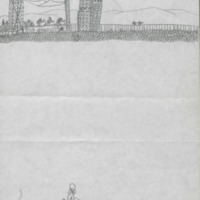 Drawing in graphite of a 1970s-style outdoor music festival in which the musical act is very far away from the viewer.